travelodge.ie Vouchers, Discount offers and Free Gifts in April 2019. Redeem a travelodge.ie Voucher from voucher-code.ie and get your benefit at travelodge.ie. 100.000 Rooms from €39 at travelodge.ie. 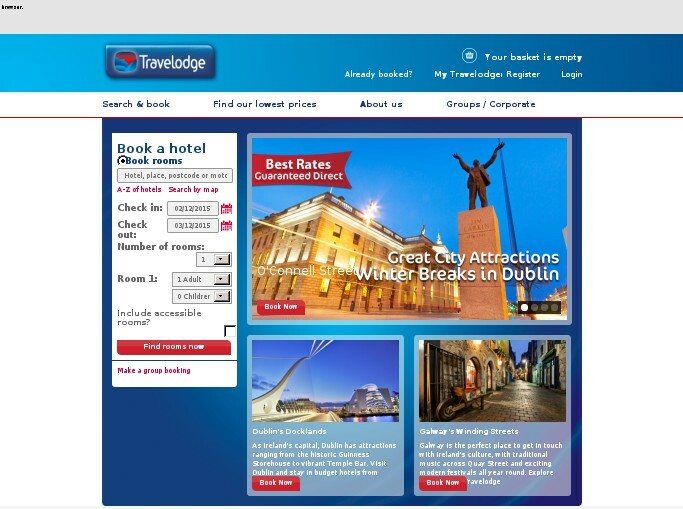 Click on "USE ROOM OFFER >>" to get access to travelodge.ie and use ROOM offer. Never miss again a travelodge.ie voucher or sale offer! Travelodge Ireland is Ireland's leading provider of Budget Hotels with 11 hotels in Ireland. They offer great locations with 4 hotels in Dublin, 2 hotels in Limerick and hotels in Belfast, Derry, Galway, Waterford and Cork Cities. Travelodge offers excellent value and hospitality in order to meet the needs of both business and leisure guests. Rates available all year round from as low as €39 per room. At Travelodge, the Hotel revolution doesn't stop with just the price. They've carefully designed the hotels to give you all the things you need without having to pay for things you don't. Please enter a Travelodge ireland voucher code directly in the 'Discount code:' box on the basket page and activate encashment by hitting the "submit" Button. Discounts will be applied only if the code is valid and meets the minimum value required. £10 OFF flexible bookings for stays from 1st July - 31st August only for new customers at travelodge.ie. The travelodge.ie Voucher can be redeemed without a minimum order value.